As much as I dislike winter, it has one bright spot: It's flowering time for many aloes. In our zone 9b climate the peak is usually late January so we still have a few weeks to go before the fireworks go off. However, that doesn't stop me from checking my aloes every day. I enjoy seeing even the smallest amount of progress! Here's a look at what's happening right now. The Aloe cryptopoda next to our driveway started to flower a month ago. It sent up two flower stalks, but unfortunately one of them (on the right in the photo below) got bent over by the nasty winds we had a few weeks ago. 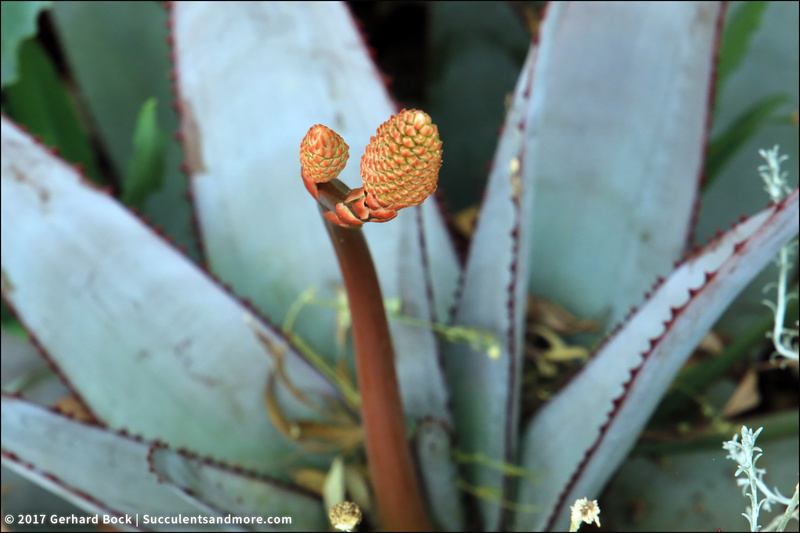 Aloe petricola is working its way up my favorites list. It looked fairly generic as a small plant, but it's developing good stage presence now. We have three clumps of Aloe 'Moonglow'. All of them are sending up multiple inflorescences. 'Moonglow' is a hybrid created by South African breeder Leo Thamm of Sunbird Aloes. Unfortunately, only a handful of his hybrids are available in the U.S.—'Erik the Red' (see below) is another one of them. 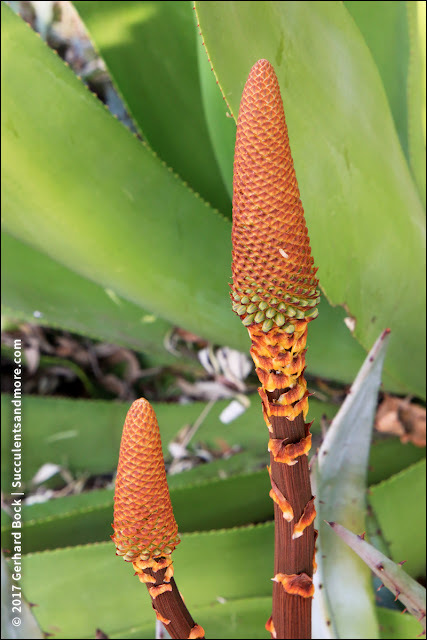 The sand lily (Veltheimia capensis) on the left is beautiful, but the real star here is Aloe capitata var. quartziticola, one of my perennial favorites. With its steely blue leaves often tinged purple and its dark purple teeth it's a standout year round. The unusual flowers are icing on the cake. 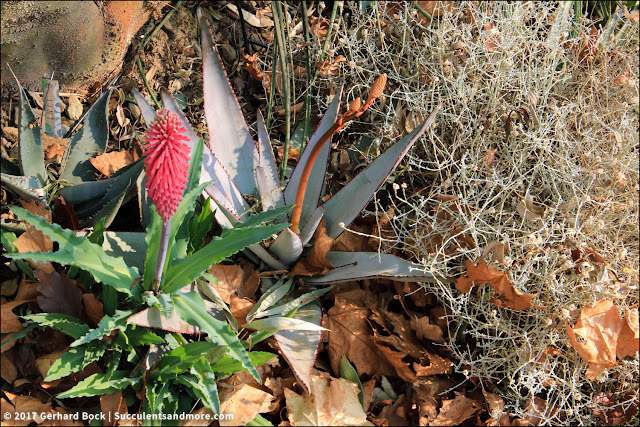 Next up is Aloe 'Erik the Red', another Leo Thamm (Sunbird Aloes) hybrid. It's in my top 5, both for its graceful looks and its blood-red flowers. 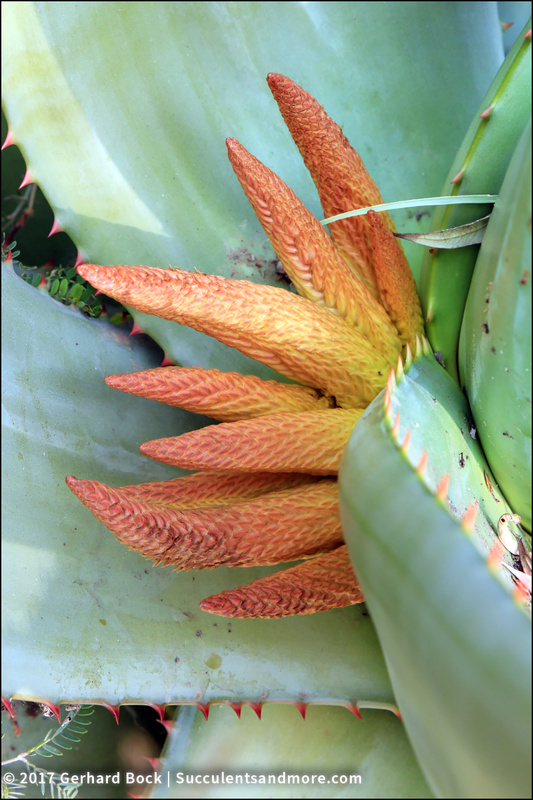 Aloe burgersfortensis, one of the prettiest of the spotted aloes, may be working on a flower stalk as well. It's still too hard to tell whether the two little nubbins in the center are leaves or flowers. In the backyard, Aloe zubb had taken a bit of a breather but is now back in flowering mode. It blooms a good nine months out of the year. And finally my clump of Aloe cameronii × maculata is flowering away. It gets about 3 hours of direct sun so the leaves are apple green. In the full sun they would have a reddish hue. 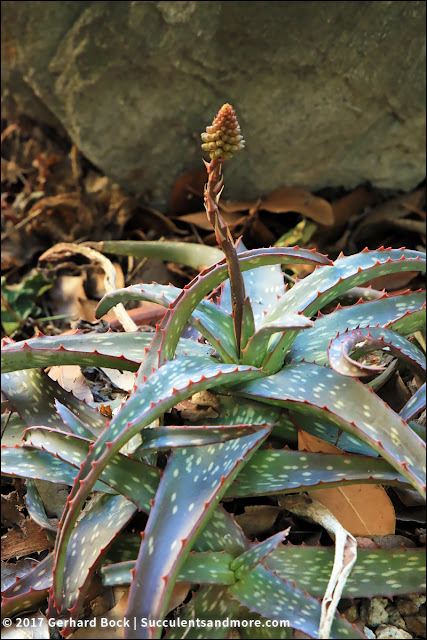 I can't wait to see if the Aloe vaombe I bought at Poot's in the spring will flower, too. No sign yet. Maybe it still needs another year or two before it's old enough to bloom. Your aloe collection is larger than I'd realized, Gerhard, and everything looks great! Thank you, Kris. I actually have a lot more, but many are still small. 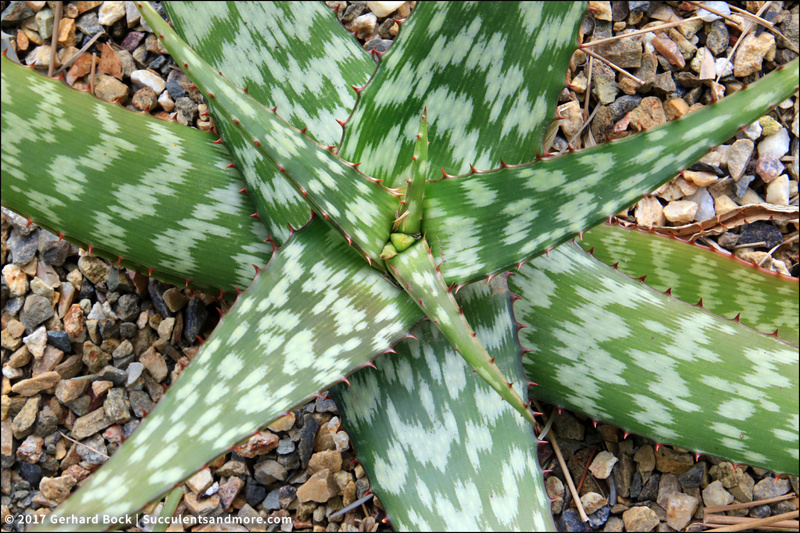 I'm particularly excited to see what some of the more unusual hybrids will look like as adults (like Aloe marlothii × globuligemma, Aloe peglerae × white-flowering ferox, Aloe littoralis × Gasteria acinacifolia, etc.). I've had a solid week of frost,the coolest being 27. 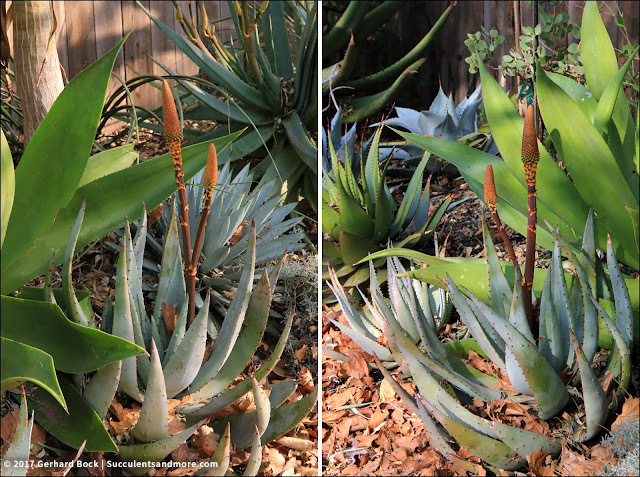 I feel pretty victorious because all of my Aloes are holding their own. I always worry about them when we dip below freezing. I have plans to go up to Berkeley next month. It might be early but I have so much travel in Feb and March it will be my best opportunity. It only got to 32°F here. I didn't cover anything and got away with it. Whew. I'm checking buds daily too. I have a newly planted capitata var. quartizicola that has a mature bloom spike. I love this aloe too, but I've noticed that the stemless aloes, esp. the hybrids, are magnets for ants/aphis, and I lost a previous CVQ to them. The close stacking of the leaves on the hybrids provides perfect conditions for the little bastards. Taller hybrids like 'Moonglow' don't get this problem. I'm inclined to avoid the stemless hybrids for this reason, but am using the Safer soap on the ones I still have -- not a great long-term plan since I rarely keep to any spray regimen. 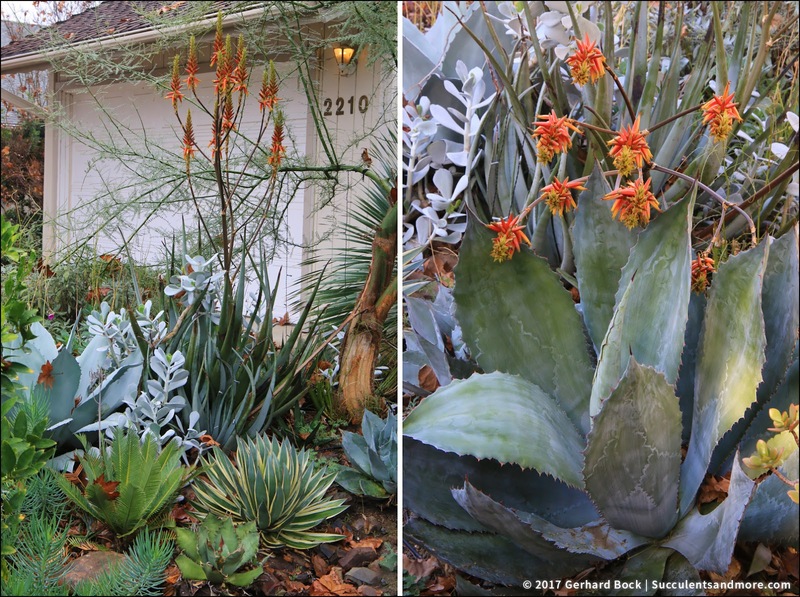 But enough quibbling -- yes, I love the winter aloes too, and you have an exciting collection of them. I don't have problems with aphids, but I battle mealybugs every summer. 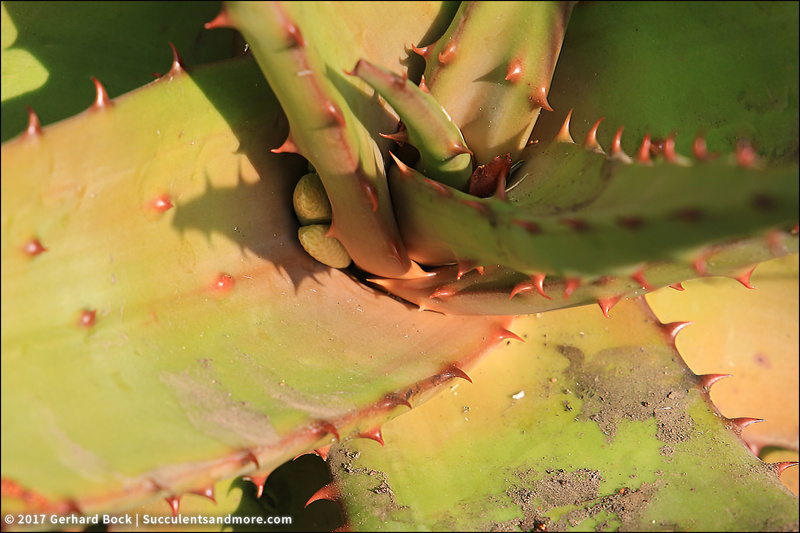 Although not so much on aloes. But some aeoniums, cacti and echeverias, as well as my long-suffering Agave parryi, are mealy magnets. 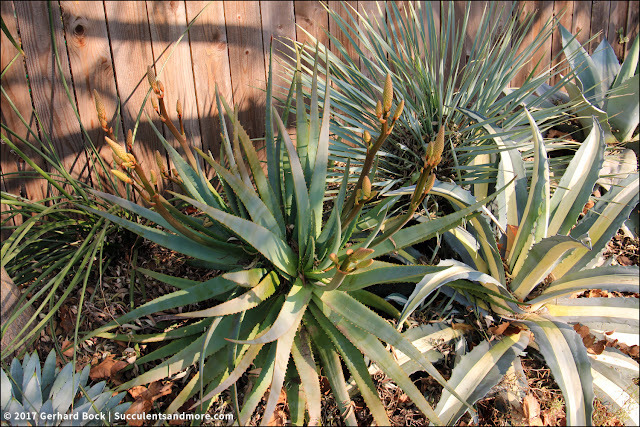 Curious about what you may know about that cameronii x maculata? This may be what I have in several client's gardens but didn't know what it was. Does yours bloom over a very extended period? 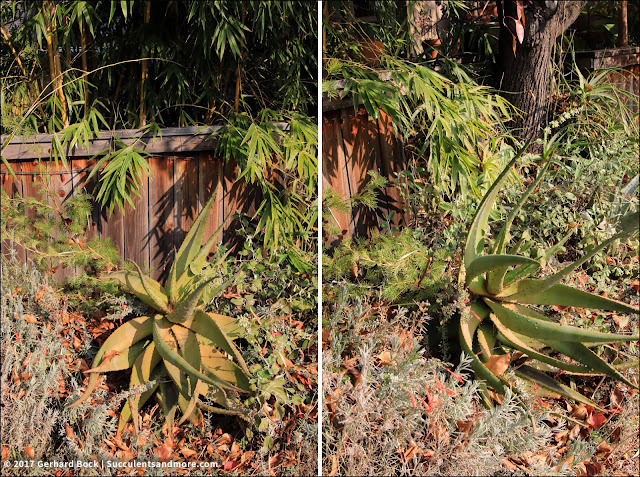 The plant here in the Bay Area blooms summer into winter here, but then cameronii tends to bloom repeatedly here too. Nice collection you've got going there. David, my Aloe maculata × cameronii (or the other way around) originally came from Yucca Do Nursery in Texas. It's proven to be an enthusiastic grower. I don't know how many pups I've given away. It seems to flower now and then again in late spring--like cameronii, as you said. Congrats on the first flower from excelsa! Finally saw 'Erik' for sale here, and it was gall-mited. Grrr. CvQ absolutely a favorite--the foliage color alone is a marvel. I can even remember when I got that Aloe excelsa from. I was probably a small pup. 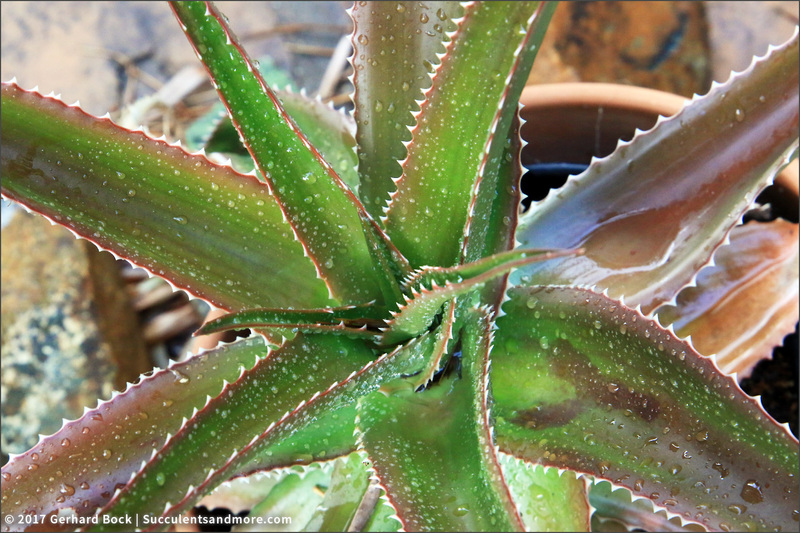 Damn those aloe mites! I saw four or five large 'Always Red' at the Home Depot recently, and at least two had very noticeable infestations. I have three quartziticola now, and they do well in full sun and mostly shade. 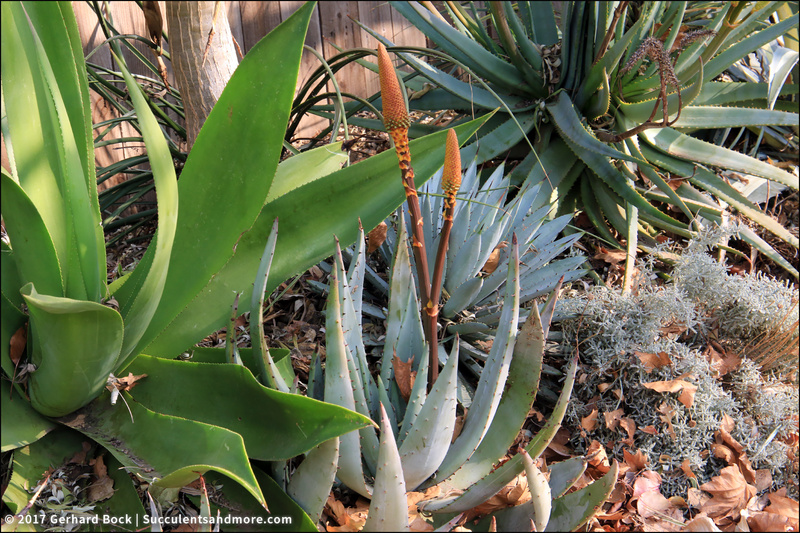 I'm always looking for aloes that don't mind shade. 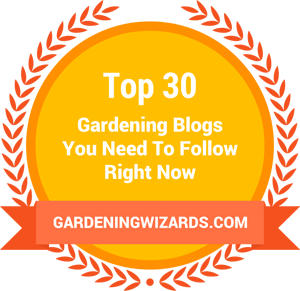 Your garden is looking fantastic, I love how you pair spikes with spikes!! 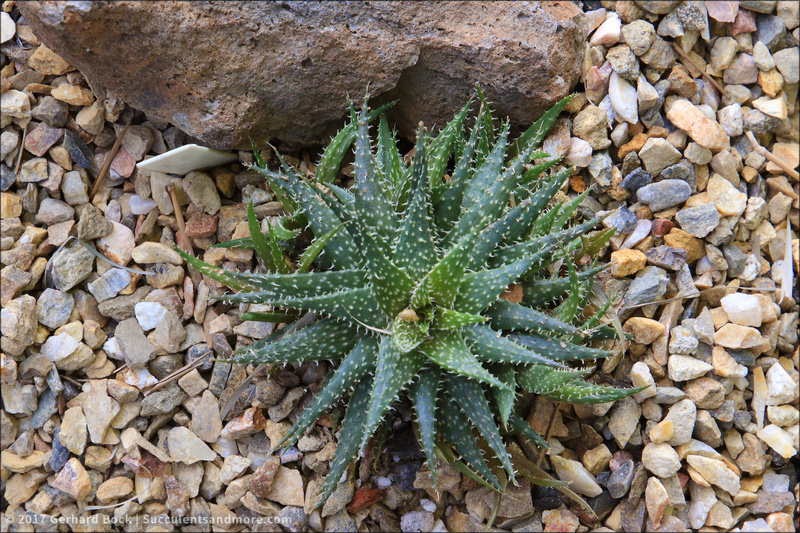 Your collection of aloes is definitely envy inducing alone! I highly recommend ordering from Institute of Aloe Studies, and picking up in person if you can. Really( cheap!) healthy plants from an amazing collection. If you're ever in East Oakland... John Miller (the owner) was kind enough to give a tour of his personal garden and collection at the Oakland Zoo after I purchased two measly aloes (elgonica and scobinifolia). Quite a show you're having there. 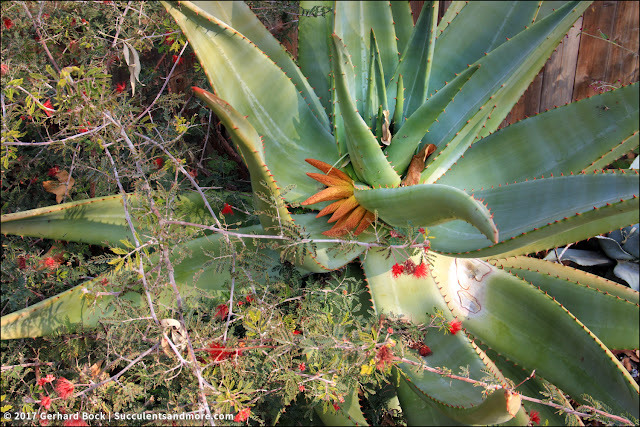 I'll have to get to the Ruth Bancroft garden to see some more. Nice how many flowers you’re getting. I just potted up the cameronii cutting you gave me. Pot full of pumice. Any chance of seeing wide shots of the beds that include the aloes once they're blooming more?